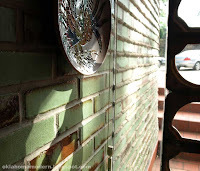 The Frankoma house was designed by Bruce Goff for the founders of Frankoma Pottery, John and Grace Lee Frank. It was completed in 1956 with a great deal of the work being done by the Franks. We recently had the opportunity to tour this unique home and learn more about the history of Frankoma. Today Joniece and Donna Frank call the house their home, and work hard to preserve it and their parents' memory. A recent Tulsa World article announced they were offering tours and listed a phone number to call. Needless to say, we had to call. Our tour ended up lasting over two hours. Turns out, seeing a unique house was the least we'd accomplished. We were treated to a unique insight into the history of Frankoma, the Frank family and the unique architecture of Bruce Goff. We left with a greater appreciation for the artistry of these pottery makers, and the unique interaction this family had with the architect who designed their home. The Frank Home is perched along the side of a terraced hill on the outskirts of Sapulpa. Approaching the house your first view is the elevated swimming pool with its cantilevered deck. From this angle, with the Oklahoma flag flying, it almost looks like the bow of a ship. Behind that is the main house, clad in terracotta tiles and arching across the width of the property. Pulling up the driveway takes you behind the home where the main entryway is. The entrance is a curved wall of glass and tile punctuated by two circular brick turrets. Above each turret is a huge terracotta-colored planter. Tiled steps lead down to a massive glass door set on an off-center hinge. Behind you is a wall of sandstone covering the hill that was scooped out to make way for the complex. Standing here you see the house virtually as it was built in 1956. The only adulteration being the garage to your left, converted from a then-popular carport. Those unique tiles covering the entryway (above) were made by Grace Lee herself. Each one painted by hand and lovingly applied to the inside and out of the glass front with mastic. The idea was so unique John was granted United States Patent 3017724 on the concept, a "colored wall that allowed light to pass," as the patent read. If you're familiar with Frankoma pottery at all you'll recognize the green of the bricks on the turrets (right). John Frank invented this glaze and called it Prairie Green. 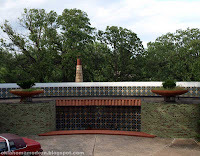 The bricks were locally made in Sapulpa, then taken to Frankoma's plant where glaze was applied to each brick, just as if it were artistic pottery. Once you step inside you see the house is essentially one room in a wide semi-circle. The ceramic-tiled fireplace and sunken living room dominate the center of the house with kitchen/dining area to your left and bedrooms to the right. The three bedrooms are each separated by sliding air walls which can be retracted to transform the entire house into one long room. Trying to quickly document all of the interesting features of this house is impossible. I offer this only as a cursory observation to entice you to pick up the phone, call Joniece or Donna, and enjoy your own tour of this unique snapshot of Oklahoma history. Tours of the Frank House are no longer being offered. Since this article was published the sisters have struggled to maintain the house. A trust has been formed and hopes to make the home a museum. Stay tuned to this website for news and updates about future developments.